A relieved homeowner is praising Prince George's firefighters who he says saved his dog, Duffy, from a gas leak last week. Tuesday, firefighters from the Camp Springs area responded to a natural gas leak after a contractor broke a gas line in the 7000 block of Berkshire Drive. Nearby homes had to be evacuated. 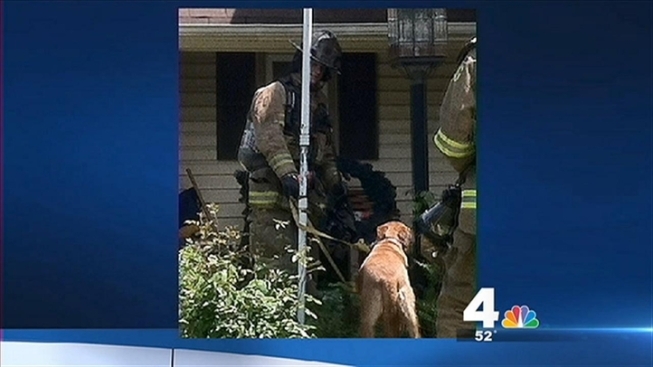 As the crew from the Morningside Fire/EMS Station, led by Firefighter/Medic Captain Donny Fletcher, went door-to-door evacuating homes, they found a dog home alone with high levels of natural gas inside the house. They rescued the dog, getting it into the fresh air and giving it food and water. "There was a gas leak outside of your house & we had to break your door in to make sure no one was home," the note reads. "Once in, we found high levels of gas & had to get your dog outside to fresh air. She was scared at first, but came outside after some coaxing. She pee'd and pooped around noon & hung out with us at the fire truck. We put her back inside & gave her fresh food & water." The homeowner said the firefighters went way beyond the call of duty. He expressed his appreciation in a letter sent to Prince George's government leaders. "I would not expect anyone to take care of a strange dog," Hunt wrote. "In addition to them taking care of our baby, they opened all the windows for safety reasons. Duffy was returned home and is doing well.